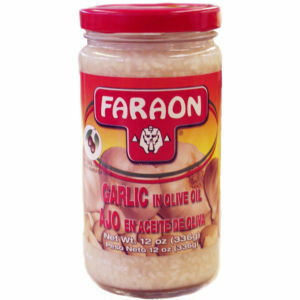 Faraon Garlic in Olive Oil is packed in an attractive 12 oz glass jar with a re-closable lid. This product is for those garlic lovers who also appreciate olive oil. This product can be used for cooking, adding to salads, or simply adding to bread as a seasoning. Should be displayed in the produce sections, in the condiment section, in the meat departments. Place in the section next to Mojo Criollo and Olive Oil.